Food is getting scarce - and expensive. This is no longer news. But can we really confine ourselves to thinking about the agricultural end of this problem? 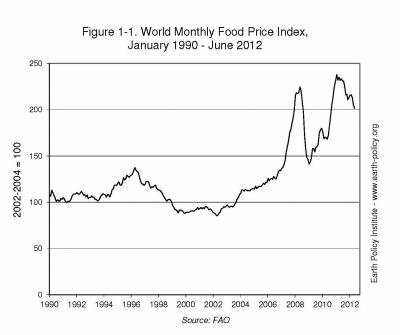 Larry Elliot, writes in the Guardian that ‘the era of cheap food may be over’. He's absolutely right in one crucial fact; the world faces some tough decisions. Aside from that, however, this was an article from a business desk: a lightened version of human and environmental damage and a broken agricultural system that agricultural solutions will fix. But it's the wider problem that needs to be addressed. The article covered all of the most reported fundamentals of the problem. The world population is growing, we are burning crops as bio-fuel, developing nations are eating more meat, meat is produced by feeding grain to livestock. Then there is the man-made problem we can’t instantly do anything about; changes in the climate have exacerbated a US drought and destroyed harvests. Elliot did not mention that the same has happened in Russia. Elliot likened the end of cheap food to the end of cheap oil, but failed to make the connection between the two. Modern food is flown and shipped all across the world. Using oil. Modern crops are grown using massive quantities of fertiliser produced at incredibly high temperatures. This creates carbon dioxide emissions, which contribute to global warming. This temperature is created using oil or gas, which costs money. This is to say nothing of depleting reserves of phosphate rock that are needed to produce industrial fertiliser; phosphate rock prices have increased by more than 300 per cent in recent years, a rise that makes the price of oil barrels look stagnant. This is where you begin to realise Larry Elliot is barely scratching the surface of the problem, he plays the traditional businessman in advocating agricultural problem as agricultural solution. Genetic modifications to enhance yields, and increased and optimised fertiliser usage are at the heart of the argument. There is no mention of the bodily consequences of humans ingesting large quantities of fertiliser. There is no mention of the damage to water supplies and ocean ecosystems (the world’s biggest carbon sink) from fertiliser and pesticide run-off. There is no mention of the moral problems caused by making the rural poor reliant on fertiliser purchases from industrial corporations, and there is no mention that the best way to control population is in fact wealth redistribution. If you want high birth rates from families reproducing their labour supply, keep ‘em poor. If you want falling birth rates, give ‘em a break. The declining birth rate of the G20 is the best evidence for this, and the increased savings rate of China under single child policy shows that, through coercion and with negative effects, the correlation works in reverse. GM is similarly lauded as a silver bullet. What Elliot does not discuss is the limited shelf-life of GM seeds that are soon mapped by pests and disease, a potentially catastrophic reliance on technology instead of the natural resistance developed by seeds – through natural selection – when crop diversity is promoted. In 1999 the academic James Boyce released an outstanding paper on the globalisation of market failure. Boyce noted that 2.7 million Mexican smallholdings (increasingly squeezed by the free trade that apparently empowers us) used fewer fertilisers and pesticides in growing 5000 varieties of maize, while half of the US’ 200 million ton maize output was comprised of just six varieties. Boyce notes that a pest destroyed 20 per cent of US maize harvest in 1970, and that even genetic modifications rely on real life crop diversity to engineer high-tech solutions to problems that maize species would otherwise adapt to naturally. This is to say nothing of the ill-effects of genetic modifications in the food chain, and nothing of the social conflict caused by Mexican farmers moving to find work in US cities when industrial agriculture makes small farms nonviable. At this point it becomes increasingly obvious that Elliot is talking inside a political vacuum. He doesn’t mention that when the purchase of world food is driven by competition with the world’s largest financial institutions it tends to nudge the price up a smidgen. Elliot talks of developing countries adopting western diets, ignores that we’re actually pushing our diets onto them through institutions like the US Meat Export Federation. The power of these lobby groups is such that, if arable land is indeed wrested away from the production of bio-fuels, it will most likely be at the behest of a livestock industry outraged by high feed costs. Don’t doubt that we will feed animals before we feed humans. This isn’t to say that the article completely neglects to mention human costs, it just obscures and understates them. Elliot hypothesises food riots, which looks good in print, but the reality is more likely to be people starving slowly and quietly without any media-friendly riot to go pointing cameras at. Famine is like so 1980s… and remember that nobody riots on an empty stomach. Across Kenya the Maasai have to travel further and further to find the pasture where they graze the animals from which they live, the human equivalent of a polar bear made to swim sixty miles for the nearest chunk of ice, and the consequence of rose plantations that deplete groundwater for the sake of cheap flowers in our supermarkets. The end of cheap food is the least of the problems caused by the arrogance of industrial agriculture, most of its victims will likely die unseen. That you can’t talk about the environment in a debate about economics - without being taken for a hippy - is less a problem for the planet than for anybody intending to live on it. Most conspicuous in Elliot's comment is a lack of positive thinking, with no attention given to genuine solutions. From an environmental perspective, organic food needs to be supported as urgently as wind and solar power. Bad publicity has seen a spate of banks calling moratoriums on trading agricultural commodities, the mainstream needs to build on this pressure to make the decision stick. Research suggests we currently produce food for 11 billion people, it’s only catastrophic waste that forces people to go hungry. There also needs to be innovation. You can safely feed kitchen waste to hogs instead of throwing it in landfill, the only reason this is a sticky subject is because industrial agriculture gave us the BSE crisis when it started feeding herbivorous cows with leftover cow. In the case of our food production, both baby and bathwater need to be thrown out. From The Guardian’s business desk and further afield, the extent to which people commit to this will be a measure of their intelligence, and their willingness to stand up for what’s right.